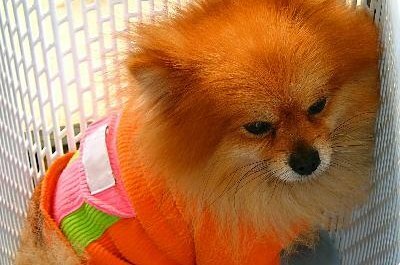 Tiny dogs, such as Pomeranians, need special care due to their small size. Small breed dogs are ideal for owners in a variety of living situations. For example, tiny dogs do better in small apartments than larger breeds. Tiny dogs do have special needs that must be addressed to keep your little canine companion happy and healthy. Crate your tiny dog when you can’t watch her closely. 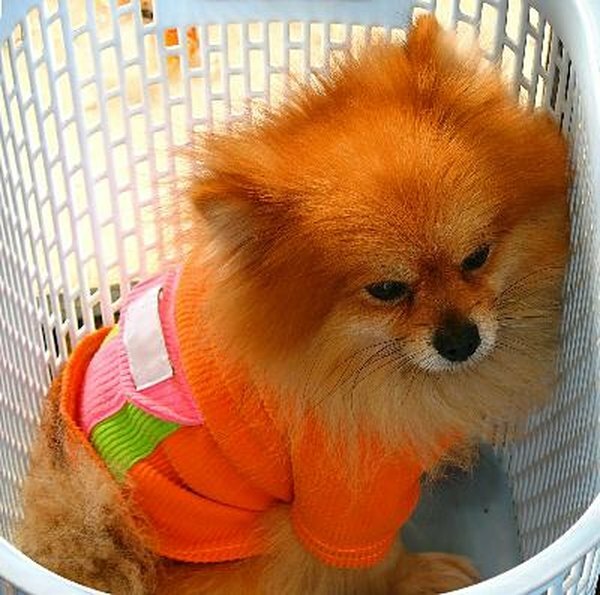 Very little dogs can squeeze into small spaces and may injure themselves trying to escape. Crating is also useful during parties and family gatherings to keep small dogs out from underfoot. Place a heating pad in the crate to keep your dog warm. Tiny dogs get chilled very easily, and a heating pad helps preserve body heat. Cover the pad with a soft fabric cover to keep your dog comfortable. Provide your dog with plenty of small dog toys. Even tiny dogs like to play, and giving her a basket of her own toys will keep her from chewing on cords and other hazardous items. Replace toys when they become frayed or torn. Feed your dog three meals of high-quality dog food per day. Tiny dogs are prone to health problems including hypoglycemia, and frequent feedings regulate blood sugar. Look for a meat- or fish-based food with no fillers such as ash or corn. Handle your dog throughout the day. Little dogs are notorious nippers and may bite if not handled enough. Pet the dog gently, run your hands over her ears and touch each of her feet to acclimate her to being handled. Groom the dog at least once a week. Many people assume that small, inside dogs don’t need to be groomed, which is untrue. Brush your dog from nose to tail with a soft brush, and check for mats in long-haired breeds. Clip her nails with a small pair of pet nail clippers, clipping off small bits at a time to prevent cutting the quick. Brush your dog’s teeth several times a week. Tiny dogs often suffer from tooth decay and gum disease, and frequent brushing will keep the teeth and gums healthy. Fit your dog with clothes during cold weather. Dog clothes, such as jackets and sweaters, help regulate body temperature and keep your dog from getting too cold. Choose tight-fitting clothes made from soft material to keep your dog warm and dry. If your dog displays any signs of illness, contact your veterinarian immediately. Vomiting, diarrhea, listlessness and loss of appetite are all signs that your dog may be sick. Never use physical punishment on your dog. Tiny dogs are fragile and can be injured by even light spankings. Positive reinforcement, such as treats and toys, are much more effective at correcting problem behaviors. Do Short Haired Chihuahuas Need Sweaters? Is it Bad for a Chihuahua to Eat Human Food? "Dogs Who Lick Couches, the Carpet & Beds"